• drill 1 in holes in the corner of your board and sand the edges. if you have a hand sander you can round the edges if you want. 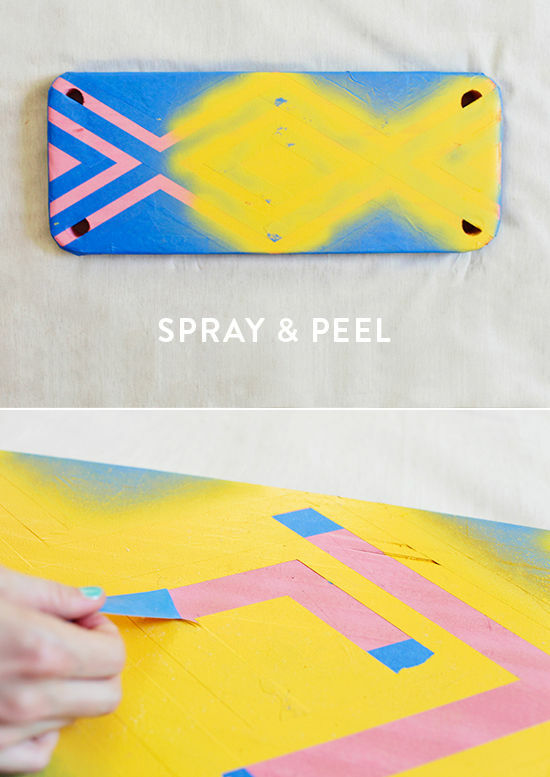 • paint both sides of your board one solid color. lightly sand between coats for a total of 3 coats. • when your base coat is dry, tape off the design of your choice with ScotchBlue Painter’s Tape and smooth edges. we love creating geometric designs since we can create such a clean edge. 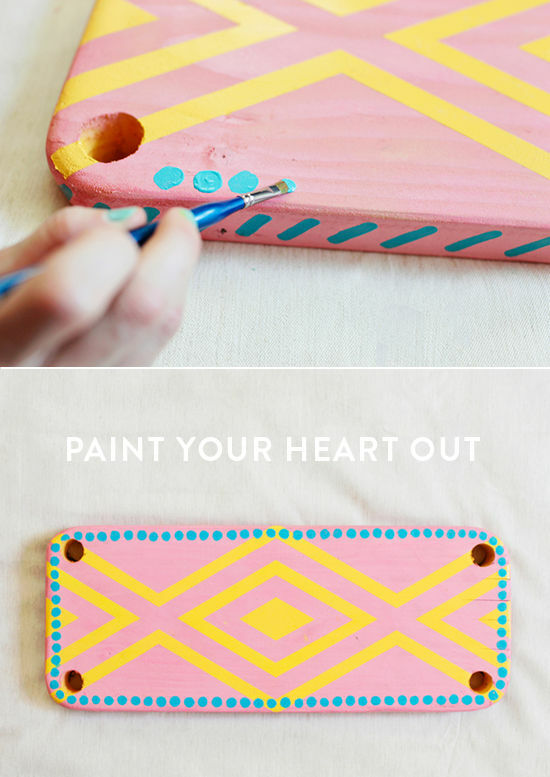 • spray several coats of paint in your second color on both sides as well. sand between coats if necessary. • when all of your paint is dry peel off the blue tape to reveal your design. • with outdoor craft paint, hand paint dots around the outside of your design to make a boarder and stripes along the edges of your board to contrast with the sharpness of your geometric design. • to help protect your swing from the elements clear coat your board with two to three coats of clear gloss spray. • because each tree is unique so is each tree swing. you may want to do some research on the best hanging method for your tree online. we found some great video tutorials on various secure knots online. we decided on two large loops to hang our swing because of the branch we hung our swing from was well suited for this type of rig. you may want to choose something slightly different depending on your own circumstances so we encourage you to consider your options and choose a method and knot that works best for your swing. *** bonus round, add tassels to the bottom of your swing once you’ve hung it for extra, extra high flying fun. Oh I totally wish I had a backyard to make this beauty! Indoor living room swing anyone? This is wonderful! I especially love the tassels at the end! This is so awesome! Love this idea and the design. love.love.love. i’ve been dying to use some of that Montana Gold spray paint because the packaging is just so damn good. Beautiful DIY! 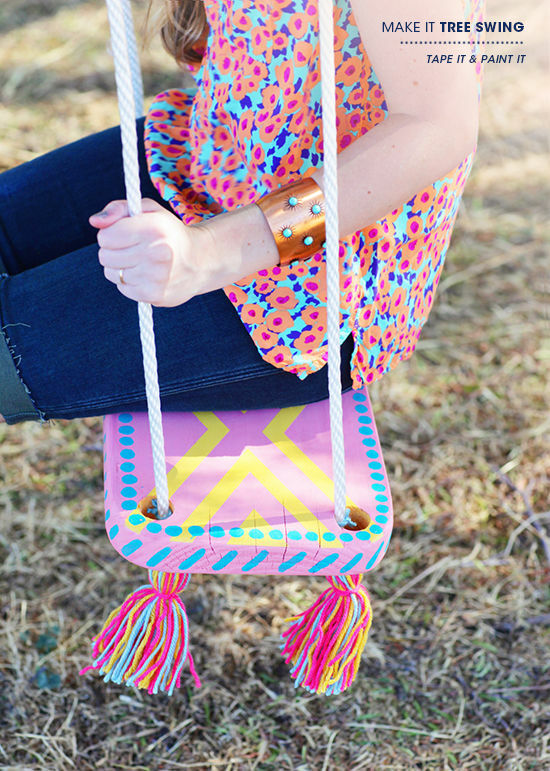 Love the colors and tassels on the swing! I remember my first swing that my dad built for the backyard. I need to revive that memory and make my own, I love @Amanda Marie’s idea of making a living room swing. Thanks for sharing! This is the perfect color scheme for summer. Love all the painted details and those tassels! 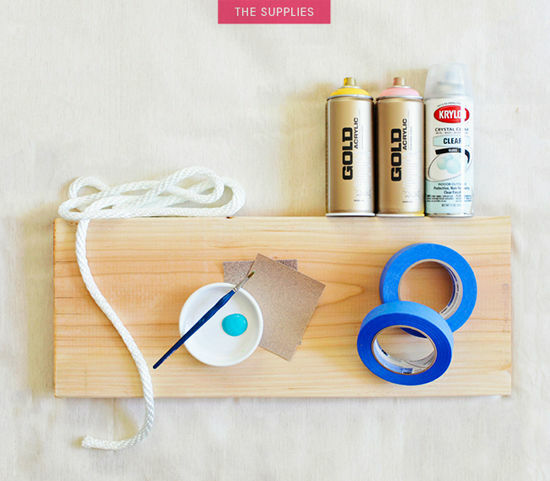 You seriously come up with the best DIYs! Can’t wait to see what you do next. Amazing! I wish I had a yard with a big tree and a swing. For now it’s just apartment living though. Thanks for sharing though – such a cute idea. This makes me wish I had a tree! 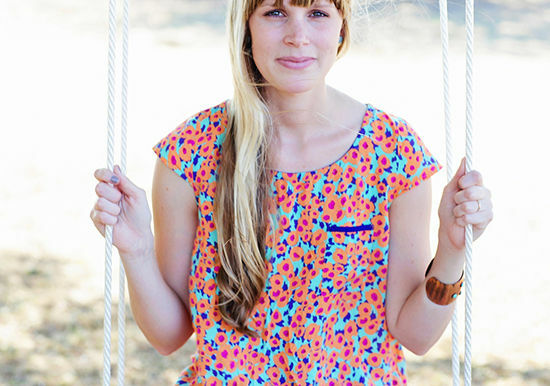 Very cute and summery! I love it! Thanks for the wonderful idea! Love how you painted it. i love her shirt! please tell me the brand! Love this! It makes me wish I had a tree in my backyard to do this. Very cute. My daughter would love this. I love this! 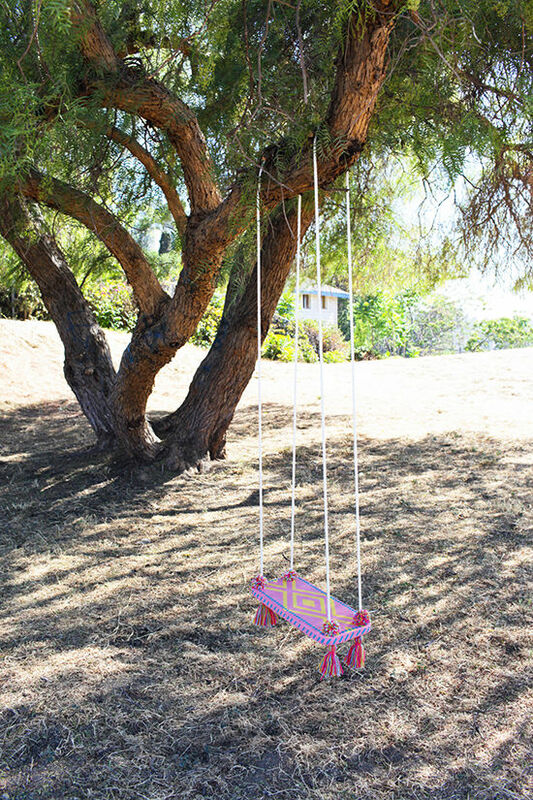 It would make the perfect swing for a little kid! I had a swing when I was small and this just made my day! Now looking for the perfect branch..
Those tassels are the perfect touch to your already whimsical swing seat! Love the color scheme. Oh I wanna have summer! German summer lets us crave for sunny seconds! Lovely summer project – I love the colour combi! i love it! wish i had a yard to make one myself. i most definitely cannot put one on my fire escape! instead, i will use this as inspiration for the top of our dining table, which will have wooden legs that fold in to hang up on the wall as an art piece when not in use. space saving and multi-use 101! Pingback: Five Good Things & Newsy Bits: Tuesday | justb. Gonna make this beauty first chance I get. So cool! My kids would love this! I have to see if we have any tree branches that could support a swing. How’d you do the tassels?? That is the cutest swing I’ve ever seen. I have a couple in my yard, I just bought one from treeswingstore.com and my kids spend hours out there. It’s a life saver for a busy mom! 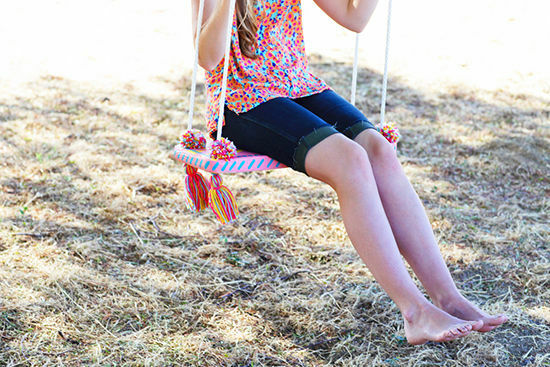 LOVE this idea to make a tree swing with flair!! How did you make the tassels? Thanks! It might look nice, but the rigging shown on this picture is very unsafe. I wouldn’t trust just two loops to hold any kind of load. Safety>design. the use of this advice. There is a notebook certainly one of the 21st century’s most significant revolutionary devices. Laptops are hardly cheap and fragile that is why the reason why they need care. producers and designers have designed and created messenger bags nz that were quite stylish. web developers, there’s an entirely different thought-process going on on the website, Nevertheless, the separation between back end and front-end is just erroneous. are going to come on to that. on how to utilize it to best suit your needs. The curtains in a room discover how the room looks and feels. There are plenty of drape models all meant for window types that are different making it more easy to obtain the curtain type that is right. Numerous factors which include the size of the design, the window and the location of the window blinds discover the sort of curtain to be properly used. of the best strategies to dress them. Pick styles, colour and the material carefully. cover bag,tenda,kompor,headlamp,outdoor,javalaoutdoor,javala,djavala,treking pole,jaket polar,jaket gunung,dryback,peralatan gunung,peralatan climbing. How do you make the edge of the board rounded.